Trim nails from the side for better grip and firm control with a side nail clipper. Nail clipper has precision blades that are offset to make trimming toenails easy. 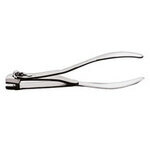 Heavy duty 4"L stainless steel clippers trim ragged hangnails and cuticles, too.